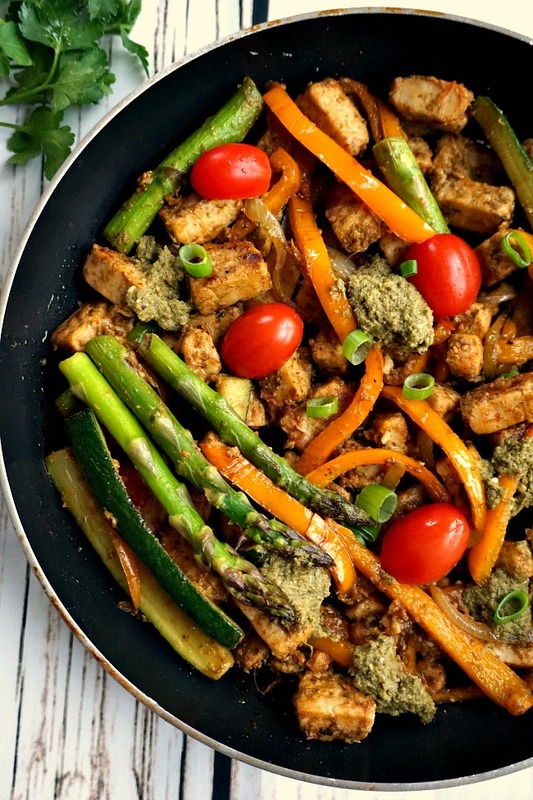 One-Pan Pesto Quorn Chicken with Veggies, a light vegetarian meal for everyone to enjoy. It might not have meat in it, but it certainly is filling and flavourful. 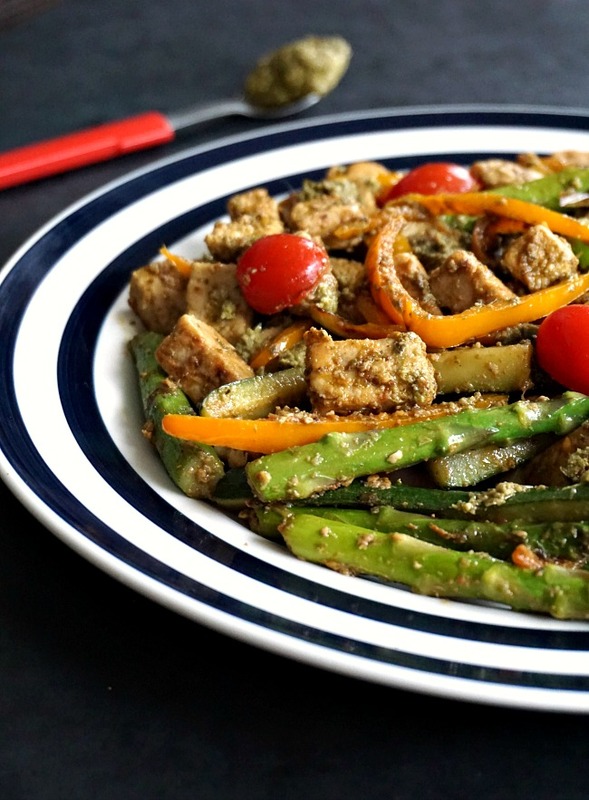 The pesto works so well with the quorn, while the asparagus, tomatoes and peppers bring a nice colour and crunch. 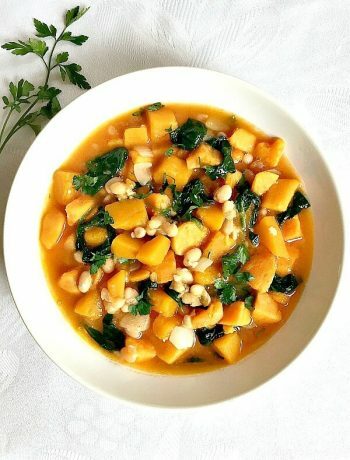 The dish can be made vegan by replacing the regular pesto, which usually has parmesan in it, with a dairy-free version. I didn’t really use to plan in advance what l was going to cook for the week, but now, with an active toddler and a forever-hungry newborn, spare time is pretty much non-existent, so a bit of planning may not be a bad idea. So rather than just buying whatever takes my fancy at that moment, l give a bit of thought what l could actually cook with those ingredients. When l saw the frozen quorn pieces, l thought they would go nicely with some crunchy vegetables. And so the dish was created. You could, of course, use chicken pieces instead, the dish would be cooked the same way. I don’t usually have pesto, not quite sure why, as it’s got a lovely distinctive flavour which brightens up any recipe. Use as much or as little as you wish, l only went for two tablespoons and the dish taste beautifully. Make sure not to use to much oil though when cooking the vegetables, the pesto has a good amount of olive oil in it anyway. If you don’t have asparagus, you can replace it with broccoli spears or just normal broccoli florets. The dish is ready in no more than 30 minutes, so no hassle whatsoever. It makes a nice chance from the everyday chicken, especially if you’d rather go meat free for the day. I don’t always have meat, and I think sometimes it is good to give the body a bit of a break from heavier food. If you wonder how to cook the quorn chicken pieces without a sauce, I would say having a non-stick pan is essential. It helps not having to worry about scrubbing the pan after. 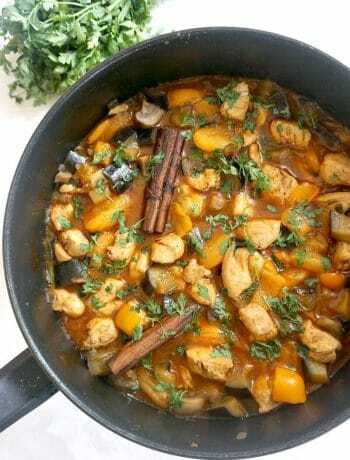 If you’ve liked my QUORN CHICKEN or any other recipe on the blog then don’t forget to rate the recipe and let me know how you got on in the comments below, I love hearing from you! You can also FOLLOW ME on FACEBOOK, and PINTEREST to see more delicious food and what I’m getting up to. 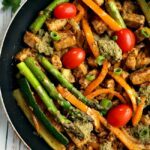 One-Pan Quorn Chicken with Vegetables, a light vegetarian dish that is bursting with amazing flavours. 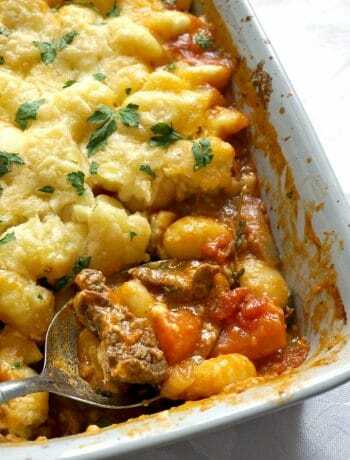 In a large pan, add the frozen quorn and vegetable stock and cook on a medium heat for 15 minutes until the stock has been absorbed and pieces have turned slightly brown. Do stir it as the pieces may stick to the pan. Remove the pieces from the pan and set aside. Cut the onion and peppers in strips, add the oil to the pan and cook the asparagus, peppers and onion for 5 minutes until slightly tender. 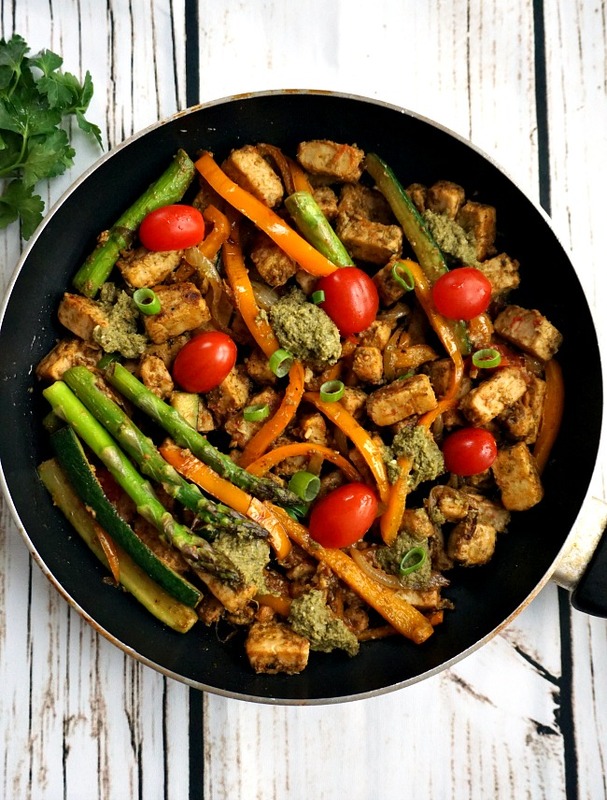 Add the quorn pieces back to the pan together with the halved tomatoes, pesto and season well with salt and pepper. Give a good stir and turn off the heat. Yumm! Looks tasty. I feel it’s good to getaway from meat here and there. Thank you! Indeed, great as a food on the go. Glad you like the recipe!